Dr Richard Streb, a former professor at Columbia University, has written a unique and penetrating account of life and death aboard the USS Essex during World War II. In addition to relating his experiences as a radar operator on the Essex, Streb has conducted extensive interviews with shipmates, and carefully researched the background of persons and events. Of special interest to those of us who served on the Essex is Streb´s research on the Kamikaze attack on November 25, 1944. This provides a good addition to the chapter entitled "Essex Takes a Kamikaze" in my Torpedo Squadron Four: A Cockpit View of World War II. Yoshinori Yamaguchi´s plane dives toward the USS Essex. 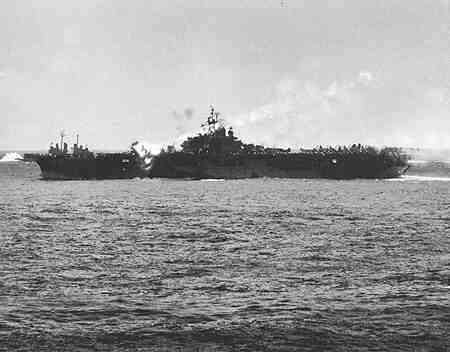 There were 17 men who lost their lives in the attack--one was the Japanese pilot and 16 were Essex crewmen. Streb has made a sincere effort to track down the families and the background of all of these individuals--a formidable task. The Kamikaze pilot´s name was Yoshinori Yamaguchi from the Yoshino Special Attack Corps stationed at Malabacat Field in the Philippines. He was flying a "Judy," number 17. Streb states, "The plane was not carrying a bomb. Is it possible that Yamaguchi was not scheduled to crash dive on that flight or on that day? Was it an excess of zeal or patriotism that set his crash course? Did he see all the planes loaded with ammunition and bombs ready for takeoff and realize that it was the perfect target?" Yoshinori Yamaguchi´s plane seconds before its impact on Essex. Note tail number 17. 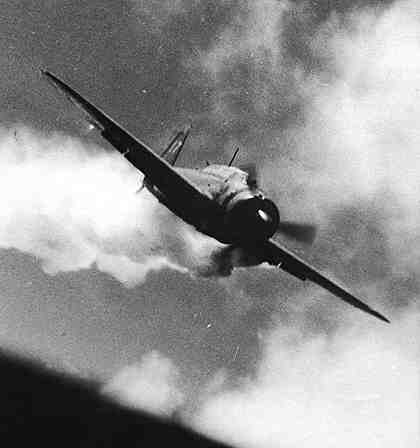 Yamaguchi´s plane strikes the Essex. Damage to the flight deck of the Essex after Yamaguchi´s attack. 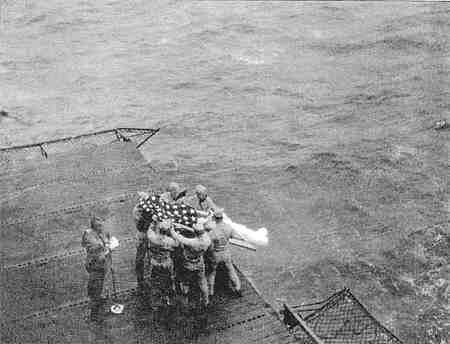 Burial at sea after Yamaguchi´s attack. Sixteen men on the ship were killed and 44 were seriously wounded. Streb states, "What makes the Essex tragedy different was the fact that eight of the men were Black and eight were White." Streb was able to trace 13 of the 16 who lost their lives. His account of these men is a fascinating and valuable addition to WWII history. One chapter deals with the military history of navy policy towards Blacks from 1893 through World War II. Blacks had different pay scales and were restricted to messman/stewards mate work. "The biographies of the men killed, White and Black, comes close to representing a cross section of America in 1941. Eight were from rural areas, four from small towns and four from urban areas." Life and Death Aboard the USS Essex is published by Dorrance Publishing Co., Inc, Pittsburgh, Pennsylvania 15222. Note: If you have a book review to contribute to AirGroup4.com, or a book to suggest that we review, please contact us here.